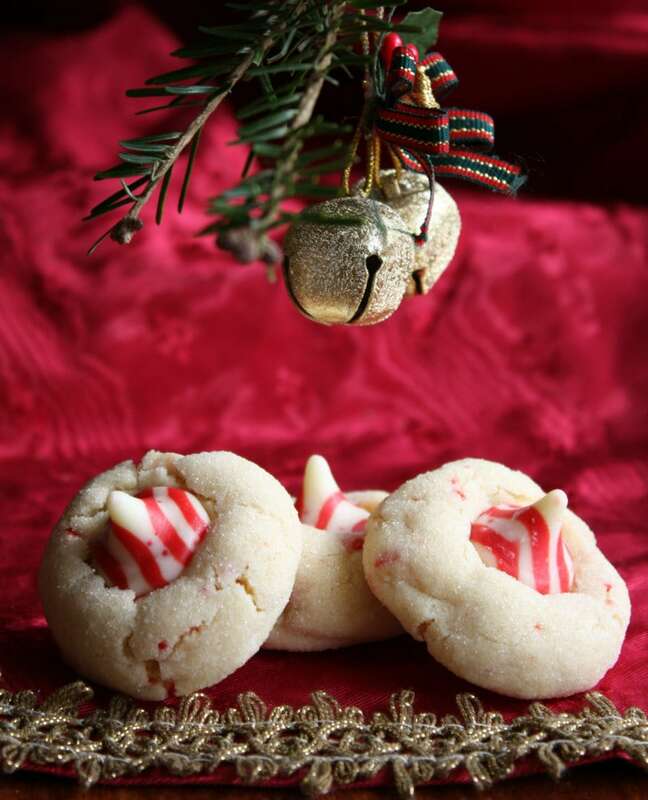 I’m pleased to share these Candy Cane Kiss Cookies with you because they’re my favorite holiday cookie recipe of all time! Watch the short video showing you how to make these cookies, then scroll to the bottom of this post and print out the recipe so you can bake them at home. You’ll want to print out this recipe and save it for the holidays. 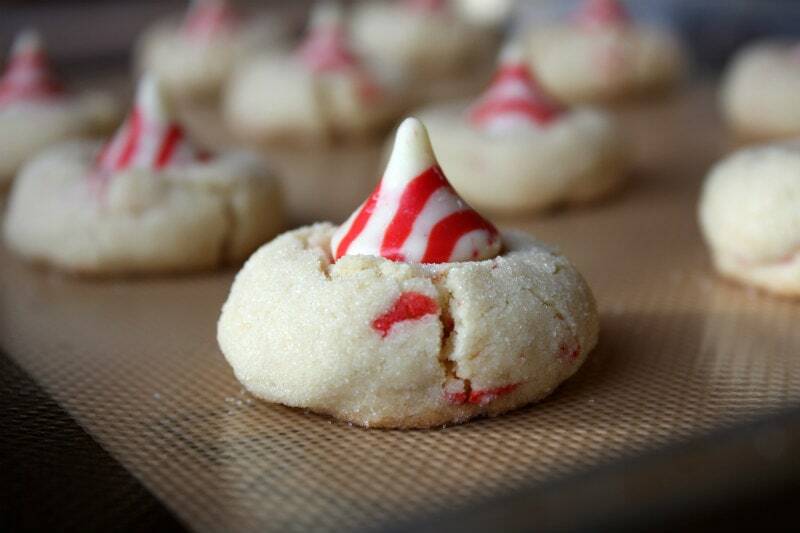 Candy Cane Kiss Cookies are teh best Christmas cookie recipe! 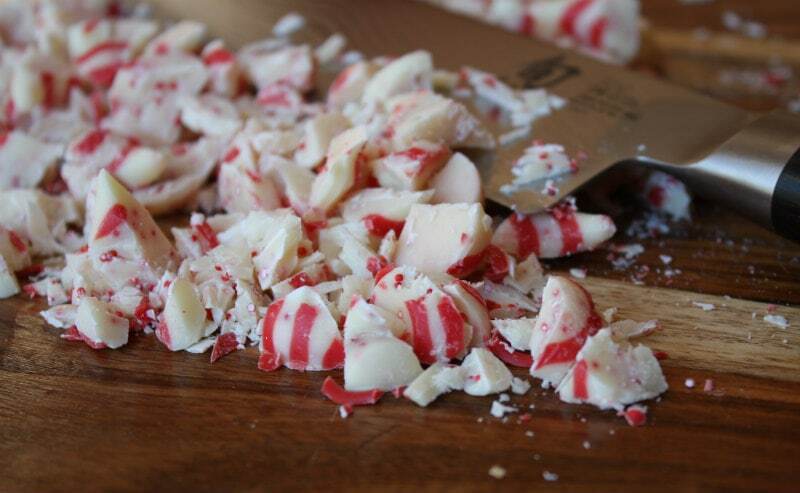 When the fall holidays arrive, the Candy Cane Kisses begin to appear on supermarket shelves too. These are an incredibly delicious flavor delivered by the Hershey’s Kisses people. And they’re amazing tucked into a cookie too. I love these things. I mean truly love these. They’re addicting, and they shouldn’t be purchased unless you plan to share… or bake Candy Cane Kiss Cookies. 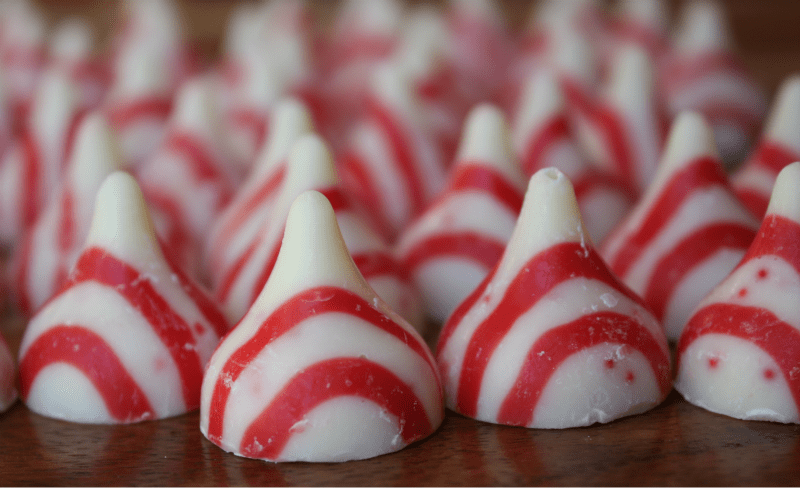 These Candy Cane Kisses can be found during the fall/winter holidays at Target or drug stores and some grocery stores too. They’re amazing little treats. And I love them. Have I mentioned that? 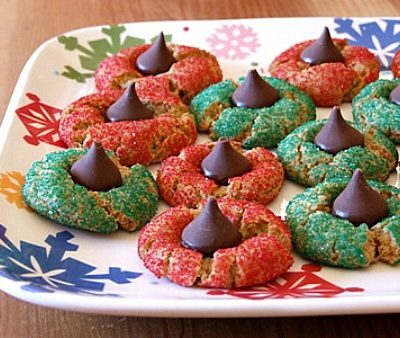 These delightful little kiss cookies have some of those Candy Cane Kisses chopped up and incorporated into the cookie itself. 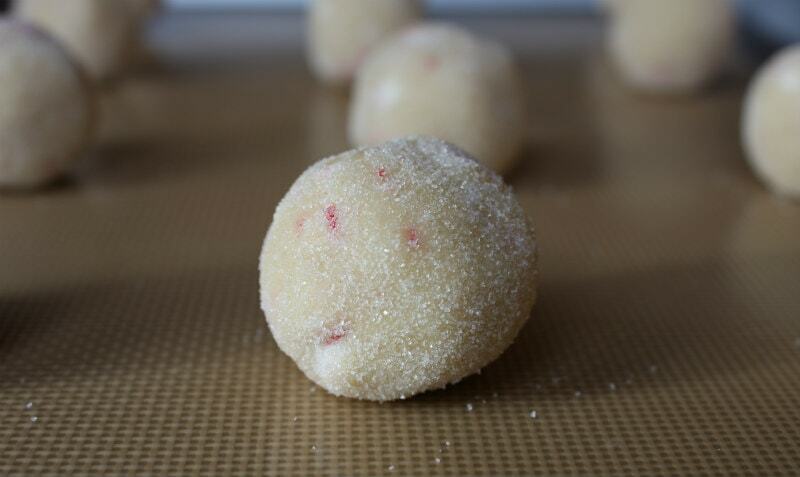 The pepperminty cookie dough is rolled into balls and then tossed in a little bit of granulated sugar. 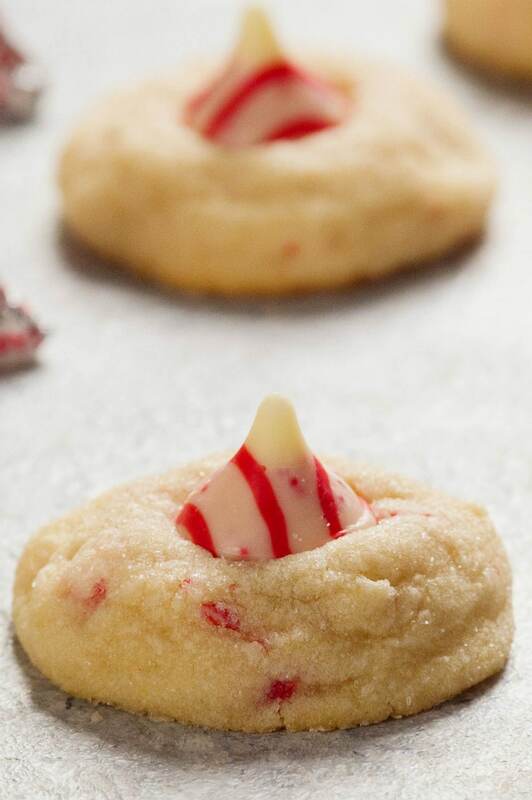 And the baked cookies are topped while warm with a Candy Cane Kiss. Then they’re placed into the refrigerator or freezer to set the chocolate so it doesn’t melt into the cookie. They’re such a pretty cookie for the holidays. 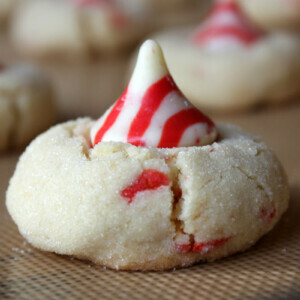 Candy Cane Kiss Cookies are good make-ahead cookies. They freeze well… so you can take them out for cookie platters when you’re ready for plating, or just take them out of the freezer and chow-down on Christmas treats when the mood happens to strike. I believe they’re the best Christmas cookie recipe because they’ve been the number one favorite on my holiday cookie platters every year for the last ten years now! When my son was little, he used to think these cookies were a good one to leave out for Santa, along with a glass of milk and a carrot for Rudolph. 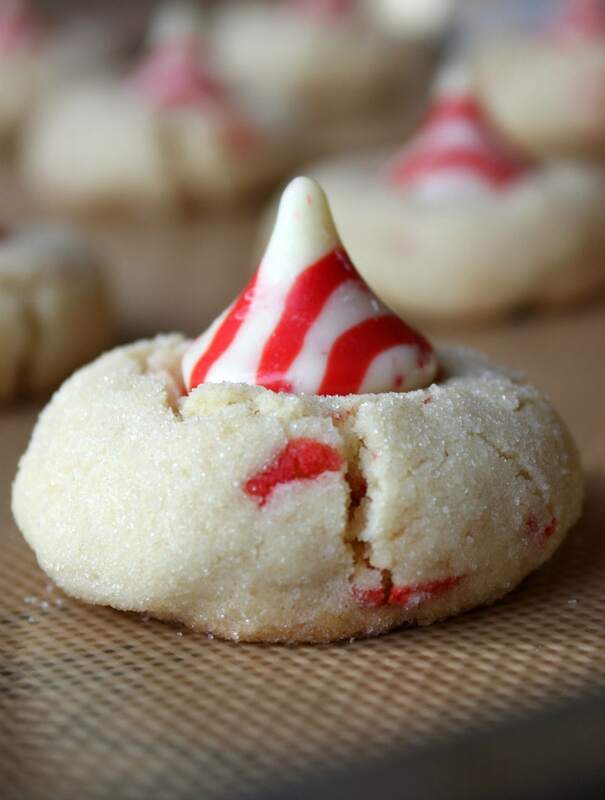 You must find these specialty Kisses this holiday season and try them, and then definitely make some Candy Cane Kiss Cookies too! 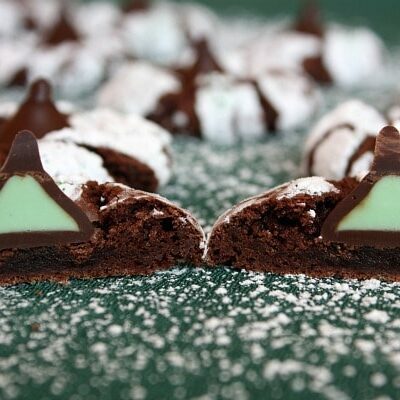 If you’re looking for more festive cookie recipes for the holidays, you might also like to try my Chocolate Mint Wafers or these Holiday Nuggets. Christmas Crinkle Cookies, Molasses Honey Ginger Cookies and Gingerbread Christmas Tree Cookies are lovely holiday cookies too! These are the best holiday cookies ever! Preheat the oven to 350°F. Make room in either the refrigerator or freezer for your cookie sheet. In a large mixer bowl, use an electric mixer to combine the powdered sugar, butter, egg and extracts. Beat at medium speed, scraping the bowl often until creamy (2 to 3 minutes). In a separate bowl, whisk together the flour, baking powder and salt. Add the dry ingredients to the wet mixture and beat, scraping bowl often until well blended (1 to 2 minutes). The mixture will be a bit crumbly. Stir in the chopped Kisses. Shape the dough into 3/4-inch to 1-inch balls; roll in sugar. Place 1-inch apart on cookie sheet. Bake for 10-12 minutes or until set. 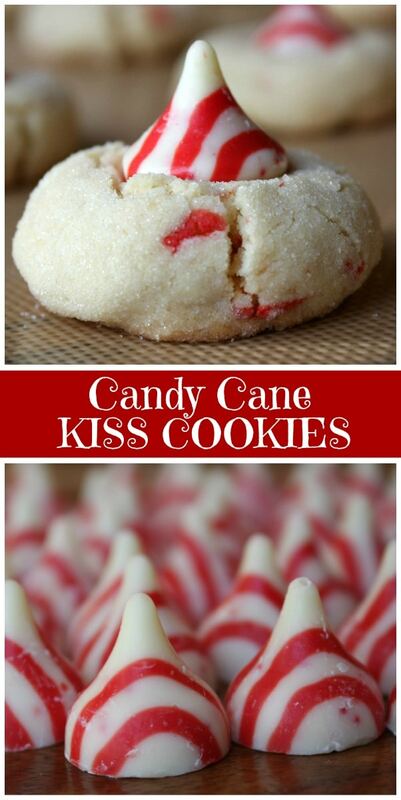 As soon as they come out of the oven, press a Candy Cane Kiss into the center of each cookie. They'll crack a little around the edges, so just use your fingers to kind of hold the cookie together while you set the kiss inside. Put cookie sheet (with cookies) immediately into the freezer (preferred) or refrigerator so that the Kisses will set quickly. 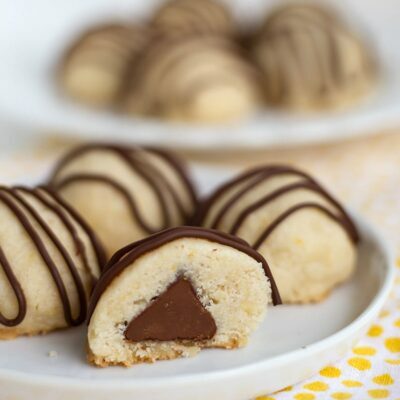 As soon as you press them into the cookie, they will begin to soften... so if you can get them into the freezer then they will keep their Kiss shape. Store in a covered container- at room temperature for up to a week. In the freezer they should be okay for a couple of weeks. *The addition of peppermint extract is completely optional. 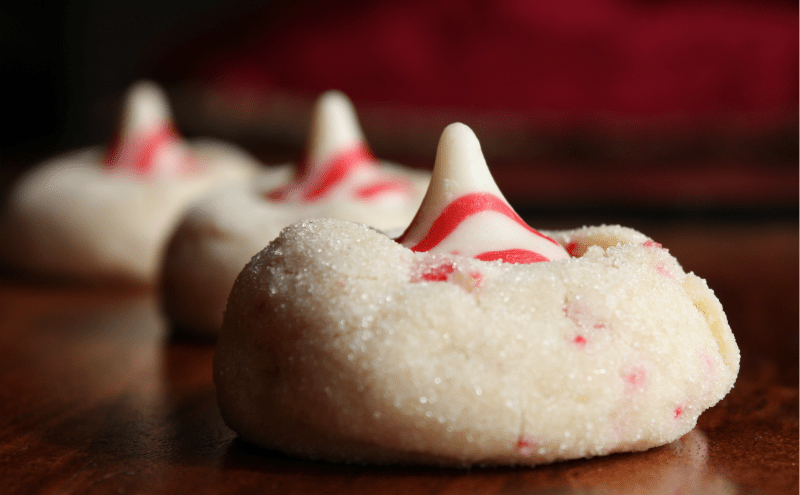 The cookie gets plenty of peppermint flavor from the addition of the chopped kisses, but if you’d like it really minty then go ahead and add the peppermint extract. *I’ve spotted these Kisses at Target and CVS Pharmacy. Can I use pre made sugar cookie dough to save some time? The cookies are absolutely delicious! I made my own errors by not using enough dough for each cookie, therefore, winding up with 72 instead of 30. Also, did not heed your advice about quickly putting them in my refrigerator. Many kisses melted! Will definitely make these again next year. I think they should be fine with other cookies! 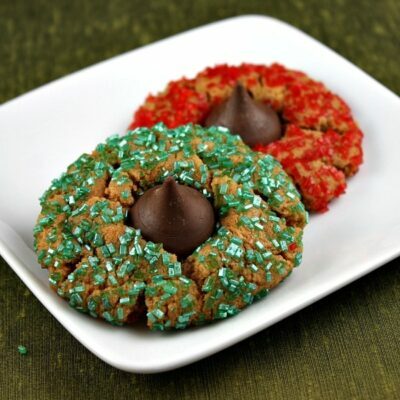 Perfect Christmas cookie – those kisses are always so pretty and festive! Could cookies be any cuter? I don’t think so. These are going to be perfect for my office cookie exchange. Such an amazing holiday treat! Love it! So cute and festive! Can’t wait to make these this year. So fun and festive all your guests will love them. These look so pretty on holiday dessert tables! SO festive and tasty! I can’t wait to bake another batch! Woow. It would be perfect for Christmas. Thanks for the recipe.